After "Angel of Mercy" (L&L 28) was released, we received hundreds of requests from people who wanted a little boy or a baby to place with the angel, instead of the little girl shown in the first design. "Angel of Mercy II" was created in response to these requests. This two-sided chart shows how to create several versions. There are options for the angel holding a baby or leading a young boy or a young girl. The angel is shown facing to the right, the opposite of the first "Angel of Mercy." She has long auburn hair that floats between her wings. Her gown is edged in white lace and gold scalloped edges with clusters of blue roses. 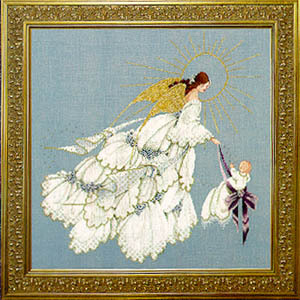 The same threads, beads and linen are used as in the first "Angel of Mercy," except for 284Z which has been replaced by Petite Treasure Braid (PB01) from Rainbow Gallery. By combining the designs shown in "Angel of Mercy" and "Angel of Mercy II," you can create two designs with the angels facing each other, and personalize the children shown in the pictures. The color of the baby's ribbon can be changed as desired, and the colors in the little boy's sweater can be changed to school colors or any other colors desired. The angel can also be stitched alone. The first "Angel of Mercy" has been in the top five best sellers of all my designs. I hope you will love this one, too! Our model is stitched on 32-count Misty Blue Linen (2 over 2) from Zweigart. Copyright © 2001 Marilyn Leavitt-Imblum. All rights reserved.